Stairmaster's StepMill lets you get a rugged cardiovascular workout and a lower-body muscle workout that beats a treadmill any day. 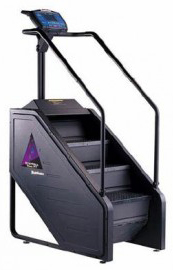 Great on your joints, this machine gas a patented revolving staircase that feels just like running real stairs, but without having to cover the distance in the real world, so you stop where you started. An electronically-controlled alternator precisely manages pedal descent. And a nationally-recognized fitness test is a standard feature of this machine, helping you gauge your progress and move right along!